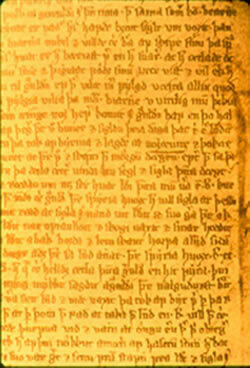 Erik Thorvaldsson, "Erik the Red"
Leif Eriksson, "Leif the Lucky"
"The Saga of the Greenlanders" was recorded in Iceland towards the end of the 14th century by an anonymous scribe. It tells of the accidental discovery of hitherto unknown lands south and west of Greenland. The discovery was made in 985 or 986, the same year that Greenland was settled, by a crew on an Icelandic merchant ship en route from Iceland to Greenland. The ship was owned by an Icelander, Bjarni Herjolfsson. Returning to his home in Iceland from a trading voyage to Norway, he found that his father had emigrated to Greenland with Erik the Red. Undaunted, he set out for Greenland, despite lacking familiarity with the route and the fact that it was late in the season. Rounding the southern tip of Greenland, now called Cape Farewell, they were hit by a storm and tossed unmercifully on the sea for some time. When the weather cleared, they sighted land. Realizing that he was too far south for this land to be Greenland and that the landmarks did not correspond to what he had heard of Greenland, Bjarni set course first northward, then east, and eventually made his way to his father’s place in Greenland in time to spend the winter there. Word of Bjarni’s discovery spread fast. People were interested in finding out more about this new land, but it was not until fifteen years later that anyone did anything about it. The first to launch an expedition was Leif, son of the paramount chief of Greenland, Erik (Eirik) the Red. Retracing Bjarni’s route in the opposite direction, Leif created the names Helluland, Markland, and Vinland for three regions with distinct characteristics first observed by Bjarni. They established a base in Vinland and called it Leifsbúðir, Leif’s Camp. From there they explored in several directions and discovered wild grapes for which Leif named the area. The second expedition was headed by Leif’s brother Thorvald. The first summer Thorvald and his crew explored the area west of Leifsbúðir. They were out all summer without seeing any sign of people except a shelter which looked like a drying rack or storage structure for hay. The next summer they investigated the area north or east of the base. One day they came upon nine people sleeping under overturned hide-covered boats. They killed all but one. The next morning they were attacked by a large group of people shooting arrows. Thorvald died. In his dying moments he instructed his comrades to bury him there and erect crosses at his head and feet. After this the crew returned to Leifsbúðir to spend the rest of the winter there. In the spring they returned to Greenland. The next expedition was arranged by another of Leif’s brothers, Thorsten. Thorsten was married to Gudrid, who figures prominently in all the Vinland sagas. Thorsten’s chief goal was to retrieve Thorvald’s body for reburial in Greenland, presumably in the cemetery at Brattahlid. Thorsten’s expedition never reached any of the new lands. The ship got caught up in a storm and was tossed on the open sea all summer, finding its way back to Greenland only in the first week of winter [in the Norse calendar summer ended and winter began in mid-October]. Thorsten died that winter. The third expedition was led by the Icelander Thorfinn Karlsefni, who had married Thorsten’s widow Gudrid. Gudrid accompanied him on the voyage. Karlsefni and Gudrid’s stay in Vinland lasted two years, and their son, Snorri, was born there. This expedition ran into conflict with large groups of native inhabitants. They felt outnumbered and unsafe and returned home. The fourth expedition was led by Leif’s sister Freydis and her husband Thorvard. They made the expedition in partnership with two Icelandic merchants, Helgi and Finnbogi, who had their own vessel and crew. Their agreement was to share equally in the profit. On their arrival in Vinland, however, Freydis informed the Icelanders that they could not use any of Leif’s buildings, so they built their own house a bit away from the existing ones. Over the winter, when everyone was at the camp, Freydis grew restless. Greedy for the goods collected by the Icelanders [probably lumber, fur, and grapes], she enticed her husband and crew to kill all the Icelanders. When her own people refused to kill the five women who were part of the Icelandic group, she grabbed an axe and did it herself. Freydis’ and Thorvard’s expedition is the last expedition described in the "Saga of the Greenlanders".